Annie Wright is proud to be an International Baccalaureate World School, fully authorized to deliver the Middle Years Programme, which aims to develop active learners and internationally minded young people who can empathize with others. The MYP provides a framework that supports students emerging sense of self and responsibility in their community. Annie Wright celebrates Middle Schoolers! Ticket to Thrive is the formal conclusion of the Middle School admission process. The event, which takes place each February, helps students and parents learn more about our campus and school culture. Participation in Ticket to Thrive ensures an early decision for the following school year. 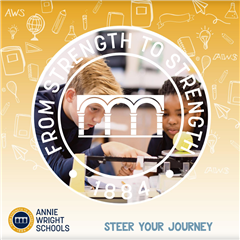 Learn more about Ticket to Thrive or any part of the Middle School admission process by contacting Joy Phelps at 253.284.8602 or joy_phelps@aw.org.